It may not sound like something to shout from the rooftop, but for me, it is a day to celebrate. I was born with an endocrine disorder called McCune Albright Syndrome. Along with a host of various endocrine abnormalities, part of this syndrome is a bone condition called polystotic fibrous dysplasia. Affected bones are replaced with a fibrous matter rather than healthy bone. An over accelerated osteoblast with a dysfunctional osteoclast cause an overgrowth of weakened fibrous bone. The first symptoms of this disorder appeared when I was five. My first surgery was when I was sixteen. Five years ago, a bone scan showed accelerated involvement of my vertebrae, along with other increases in boney lesions. I was not surprised. I could have told them which bones were involved by the pain. Walking was becoming harder, I knew something was up, yet it is sobering to look at the hot spots on the scan and connect the dots of pain. It is sobering knowing the pain is just a symptom of a malfunctioning process destroying the skeletal structure. Clearly the infusion therapy I endured for over ten years was not working. People live with the reality of losing mobility every day. Frankly, my case of fibrous dysplasia is mild compared to the ravages this disorder can wreak on a body. In facing escalation of the boney lesions, I thought about the future, a future different than I imagined previously. I was thankful we built a single story home. I was thankful I had my sons in my twenties and they were grown. My list of ‘reasons to be grateful’ was long. So was the list of ‘disappointments.’ Carrying my second granddaughter had become difficult. Riding in a car, excruciating. Walking on pavement, forget it. Walking on soil, I was too young for a cane, so I opted for a walking stick. Tim graciously carried my camera when we were out an about. I began preparing for that future. Even though I was preparing for the worst, I sought a second opinion, and from there another, until finally I tracked down a physician who I hoped could stop or at least slow the boney deformations. Late last year I began a new medication. Within a few months, my bones were quiet and I could walk on the soft soil without the aid of my walking stick. And today, six months later, I ran. Not far, only about twenty yards to and from, but I ran without wincing and without pain. 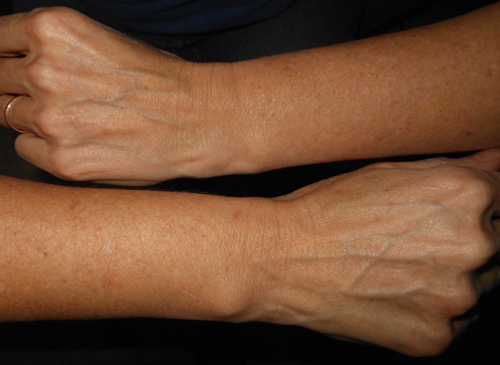 Comparison: lower wrist has fibrous dysplasia, upper wrist is normal. This entry was posted in Uncategorized and tagged chronic pain, fibrous dysplasia, gratitude, health, McCune Albright Syndrome by MaryALivingston. Bookmark the permalink. Yay! this is indeed celebration worthy! I only know you from your blog and your turkey vultures. I loved that you wrote a picture book about Turkey Vultures. It was wonderful to read this post this morning. Little improvements in one’s mobility are so elating. I hope you continue to improve and write and make a place for ugly birds. Congratulations, Mary! I hope you keep getting stronger, healthier, and better! My best wishes to you! Wow! Those are some big words and that’s a lot to deal with! I’m happy that you’ve found a source of hope and are feeling better. Thanks Rhythm. Our 4-legged family members tell me the same thing. Must be a retriever wisdom. This is wonderful news. I like this post a lot for as that old saying goes, “looks can be deceiving.” I had not idea that you have an awful medical condition. It is truly a blessing that you have found an MD that has the know how to help. I know that you must be grateful for this huge improvement. May you continue to enjoy better health and mobility. Indeed a blessing to add to countless others. You are clearly already strong. I hope your body continues to grow stronger for you every day. Thanks, I do what I can to help it along its way. May your improvements continue. Stay blissful. My endocrinologist is a true artisan when it comes to treating the human body. Definitely someone living his purpose in life. So much behind the scenes going on … good to hear of that great improvement for you Mary . Now if I can just resist the temptation to overdo it. Awesome news! Thank goodness for your determination in searching for a doctor that has been able to close in on the disease that has ravaged your body for too long. Incredible, good for you Mary – I send only best wishes for continued success in “running” toward your goal of pain-free and healthy bones. I am so glad I have Tim to encourage me along. Hey! Great post, so pleased you ran! It’s a dream of mine too! What is the new medicine you’ve had for a year now?